In December, 1945, Dizzy recorded the tune again at Billy Berg’s club in Los Angeles with Stan Levey, Ray Brown, Charlie Parker, and Al Haig (Milt Jackson was on the gig but laid out for this tune). “Freed from the three-minute constraints of the 78 rpm record, the musicians stretched out on tracks that ran for roughly five minutes. They were all in top form as they provided a fitting climax to a year of stellar bebop recordings,” says Maggin. 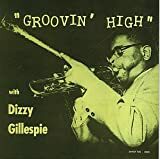 Dizzy and Bird, backed by John Lewis, Al McKibbon, and Joe Harris, performed “Groovin’ High” on September 29, 1947, to an appreciative audience at Carnegie Hall. By the ‘50s Gillespie was touring the world and was received by enthusiastic audiences in Paris (1952) and Brazil (1956). In 1982 he and Stan Getz performed “Groovin’ High” at the White House. This section suggests definitive or otherwise significant recordings that will help jazz students get acquainted with “Groovin' High.” These recordings have been selected from the Jazz History and CD Recommendations sections. Though pre-dated by a few weeks by another recording featuring Dexter Gordon, Dizzy Gillespie’s brilliant February 28, 1945 recording featuring Charlie Parker (Ken Burns Jazz) is widely acknowledged as the definitive version of “Groovin’ High.” Gillespie and Parker both recorded the song often in the few years that followed, and their 1945 Town Hall recording (Town Hall, New York City, June 22, 1945) is a good document of what they were doing with it when given more room to stretch out in their solos. Many bop-influenced musicians have performed the song since, and Lou Donaldson’s 1957 recording (Lou Takes Off) offers a particularly strong example of how the language had developed into the 1950s. A little whisper like a preacher would pray. Whispering so no one can hear me. This is a “bebop” head loosely based on the chord progression of “Whispering.”It is worthwhile to compare the two, as such a comparison illustrates the evolution of chord substitutions as applied to existing melodies, especially in its early stages. Most noteworthy is Gillespie’s use of the “ii7-V” cadence. For instance, whereas his source tune went from tonic to the chord one-half step lower (in this case, Eb to D7), Gillespie precedes the subsequent chord with a minor seventh a tri-tone away (Eb - Am7 - D7), creating a “ii7 - V7/iii” cadence that resolves deceptively back to the tonic. He does this again in mm.7-8; whereas the original tune went from I - V7(#7)/II (Eb- C7(#5)), Gillespie uses a minor 7th chord (Gm7). This type of substitution has become quite common among jazz players of the last half-century. During World War II and shortly thereafter, the Armed Forces Radio Department recorded a number of live performances by jazz greats. One from late 1945 featured Dizzy Gillespie and Charlie Parker’s group at the time of their engagement at Billy Berg’s in Los Angeles. The six-minute performance easily bests the issued recording made earlier that year. Two years later, another stunning performance by Parker and Gillespie was recorded at their Carnegie Hall appearance. Alto saxophonist Art Pepper, like many alto players of the late ‘40s and ‘50s, fell under the spell of Parker, but Art’s playing also had touches of Benny Carter and tenor saxophonist Lester Young (one Parker’s influences). Pepper’s 1959 recording of “Groovin’ High,” backed by a group of top-flight Los Angeles musicians with arrangements by Marty Paich, is a delight. This is the best-known version of “Groovin’ High” and it still sounds remarkably fresh. Gillespie takes it at a swinging medium tempo and plays a wonderful, dexterous solo, as do saxophone giant Charlie Parker and bassist Slam Stewart. Recorded only months after the tune’s original studio recordings, this one documents a live performance and thus allows us to hear both Dizzy Gillespie and Charlie Parker stretch out a bit on their solos. The band is rounded out by pianist Al Haig, who takes a nice solo of his own, bassist Curley Russell and drummer Max Roach. This recording is both the first “cover version” of the song and first big band version. Gerald Wilson’s arrangement is brash and clever, fully integrating the still-new bop language. Soloists here include trumpeter Hobart Dotson, saxophonist Eddie (“Lockjaw”) Davis and pianist Jimmy Bunn. Hawes and his quartet take “Groovin’ High” at a brisk tempo. He and guitarist Jim Hall both contribute hard-swinging and extremely fluid solos. The development of bebop can be heard well here on alto saxophonist (and Charlie Parker disciple) Donaldson’s hard-swinging performance. There are great, flowing solos by Donaldson, Donald Byrd on trumpet, Curtis Fuller on trombone and Sonny Clark on piano, while Jamil Nasser and Arthur Taylor keep things propulsive in the rhythm section. Piano giant Jones interprets “Groovin’ High” in an unorthodox trio with his brother Thad on cornet and Mickey Roker on drums. Between the hard-swinging groove, Roker’s infectious brushes and Hank’s expert bop-inflected comping, the bass is not missed at all, and both of the Joneses solo brilliantly. Singer Jarreau presents the song as a vocalese melting pot, his rich tenor taking the place of Gillespie’s horn as he scats and invents off the cuff. Drummer Alan Dawson and bassist Richard Davis keep the tempo high as saxophonist Ervin and trumpeter Carmell Jones trade hot bop licks. Pianist Timmons’ fingers simply fly across the keys as the rhythm section maintains a fast and furious bop tempo in this wonderful reading of the tune. The harmonica master joins horn players Joshua Redman and Terence Blanchard for some unison lines before devising a creative solo. The fine rhythm section features Lyle Mays (piano), Christian McBride (bass), and Troy Davis (drums).